My last newsletter was at the end of Aug 2015– three months ago. Much has been happening during that time in local government and in my own ward, – Falmer, Kingston and the villages of the Lower Ouse Valley. I continue to work closely with our County Councillor, Carla Butler, who has a ‘Report-Back’ section in this newsletter. I’m also trying to keep in touch with all the parish councils in my area. I hope you have time to look around my web site – the ‘Links’ page has links to our local MP and Neighbourhood Policing details. The right had side of every page has links to bus times information & link to reporting pot holes etc. Whilst writing Carla & I would like to wish you a very happy Christmas and best wishes for the New Year! Waste, Cockshut Lane, Newhaven, Housing, Council Tax, ‘Greater Brighton’, Planning Appeals & Issues, National Park, Major Developments in Newhaven – effect on C7? Local Transport Plan – consultation, C7 update, Roads in the South Downs, Buses, Power to the Parishes. In February 2015 the Lewes District Council agreed a 5 year waste plan. Click here to read it: Outcomes of the Waste and Recycling Review. Within the next two years the main effects of this plan will be implemented. Primarily the District Council deal with waste & recycling collection as well as things like litter collection. The ESCC are responsible for waste disposal. You can read about the ESCC Waste Plan by clicking here. For my part I do hope everyone will use the food waste recycling services. It reduces the amount of waste burnt in the incinerator for a start! Cockshut Lane – victory for residents! The second application this year to open the Cockshut Lane trackway for motorised vehicular access between Kingston Road and the tunnel under the A27 near Southdown Sports Club was again refused by the District Council. The previous application was refused in July 2015 on safety grounds. This second application for virtually the same thing was accepted by the District Council planning department as being a ‘valid’ application in August. This is great news but the situation clearly won’t stand still. Orange Badge Mobility’s consultant in their report to the Council had talked about an appeal if the decision didn’t go their way and we still have a problem in that the two gates erected some years ago are missing. Many people in the 215 objection submissions said they wanted the gates restored and this also came through in the debate at the meeting. The Autumn Statement brings good news for business in Newhaven as the government has named it one of a number of economic Enterprise Zones. Established by the coalition government in 2012, Enterprise Zones are at the heart of the government’s long-term economic plan, supporting businesses to grow. The benefits include: business rate discount, simplified local authority planning, government support to ensure that superfast broadband is provided. On a national perspective the recent Autumn Statement by the Chancellor has brought some important changes to local government. Once the Autumn Statement is implemented there will be a programme to build 400,000 affordable homes by 2021. This is an extension of the commitment that was made by the Coalition Government in the previous Parliament. This is good news but I do wonder if ‘affordable homes’ are going to tackle the problem of people who are currently at the bottom of the housing ladder who really simply need a council house (now called social housing). However in our area there will be little impact from the building of new homes as the whole of my ward is in the National Park and has limited development for major building of any sort. Still, the revised government focus will bring pressure on houses to be built in the surrounding area including Newhaven to the south and villages outside the National Park to the north. On the subject of housing, the new Housing Bill is already on its way through Parliament. It makes provisions about housing, estate agents, rent charges, planning and compulsory purchase. It covers: Measures to extend the Right to Buy, reduced regulatory control over housing associations, more focus on ‘Starter Homes,’ controls on bad landlords and letting agents, measures to force ‘high-income social tenants’ to pay up to market rents, powers for the government to ensure that all councils get Local Plans in place by 2017, and finally automatic planning permission in principle on brownfield sites. The Autumn statement also includes measures to allow local councils to put up council tax by a further 2% without there being a local referendum. Already councils can increase their council tax by 2% and this new power will allow a further 2% to be added. Why is the Chancellor making these changes? Fundamentally the reason is because central government is reducing its grants to local government to pay for ‘social care’ such as care for the elderly and care homes. It appears to me that this is cleverly switching the funding of social services from central government to local government. However we are not having a reduction in our income tax! This is not a forecast of the future council tax for Lewes District Council. Council tax levels will be discussed by the Council in early 2016. Quite separately there is a council tax levied by ESCC as well as parish councils and the Police Commissioner for Sussex. Greater Brighton City Deal – not just Brighton! This subject continues to occupy much of my time. I’m on the planning committee dealing will applications from the whole of the Lewes District. In addition to that, the lower Ouse Valley has been the subject of many planning applications and 3 planning appeals during the summer. As I write I still can’t report on the outcome of the planning appeal for the development of major buildings at Spring Barn Farm. This appeal was in the form of a written inquiry and closed on 17 July. Here we are 4½ months later and we still don’t know the outcome. For background see my previous report by clicking here. Shooting Lodge – The first one was to do with the expansion of the use of the Shooting Lodge above Iford on the Kingston Ridge. Despite the many objections this appeal was found in favour of the appellant. This means that the Lodge can be used six days a week from 7 AM until 5 PM from 1 September through to 1 February each year. My fear was that this expansion would lead to an intensification of shooting activities on the Downs. The inspector refused to link the use of the Shooting Lodge for shooting parties with shooting on the Downs. I am interested in continuing to ensure the quiet enjoyment of the South Downs, its public rights of way and the open access land. This link shows the extent of the open access land and the rights of way. If the public feel that their rights are being infringed I hope they will contact the local planning enforcement department at the Council. I had great concerns on the way the inspector conducted the Hearing and I have detailed my complaints and observations to Steve Quartermain, Interim Chief Executive of the Planning Inspectorate V S Ient Comment on Appeal Decision. I’m not sure how much good it will do. I’m also going to complain to the Secretary of State Department for Communities and Local Government (DCLG) who is responsible for the Planning Inspectorate. I believe the public needs a better appreciation of all the issues than was given by this inspector. Major Developments in Newhaven – effect on C7? These developments are good news for employment in the area but they also give cause for concern with regard to the traffic they will generate both in construction and in their continuing use. Increased traffic will also be generated by the new UTC facility currently being constructed, but of course it is good news for employment and training opportunities. Also, the construction of the Flood Alleviation Scheme by the Department of the Environment will increase the heavy traffic in the area. All these developments, as well as the many hundreds (possibly thousands) of new homes planned for the area, will significantly increase traffic in and out of Newhaven and along the C7. Yes, we do have a weight restriction on the C7 but that doesn’t stop any other form of traffic using the country lane. At the meeting where the planning applications for the port were considered I specifically asked for a condition to be applied to the planning permissions directing all commercial and heavy traffic out of Newhaven via the A26. Sadly the officers spoke against this but I shall continue to press for measures including better signage and road modifications to encourage drivers leaving the industrial areas of Newhaven to travel up the A26. I also made it clear to the committee that negotiations should have been undertaken for these port developments to connect directly to the railway system which passes the rear of the two developments! In fact there still is an operational Newhaven Marine station! As I understand it, this is not currently used for the public but is kept open by the railway company in agreement with the unions! The highway authority needs to take on board the impact of these developments and improve the road system and signage to encourage traffic to use the main A26 road in and out of Newhaven. A new plan by ESCC is out for consultation until the 21st Dec 2015. It outlines the County Council’s strategy for delivering transport across the county between 2011 – 2026. If you would like to give your views click here. To see the actual plan click here. Emphasis the need for routing traffic out of the port and industrial areas directly up the A26. Make it easier for cars to access the A 26 and not the C7 from the Peacehaven, Newhaven and Seaford directions. The C7 remains a great worry. It is really just a country lane but carries an ever-increasing amount of traffic and sometimes vehicle speeds are too high for the type of road it is. We are not going to be able to turn the clock back but we need to seek a way of improving safety and reducing speeds in certain sections of the road. One person said that the 50 mph speed limit now is seen as a target by many motorists. The government have cut back county council funds and so implementing safety measures is going to be difficult however I believe we must try and find a way. The parishes of the lower Ouse have a cooperation group which is been running for some time. This is called POLO. With the support of the parishes and POLO we have set up a C7 Ad Safety Working Group to look at the statistical evidence, issues & details etc with a view to helping formulate a holistic strategy for the whole route. The ESCC are supporting us and hopefully will be holding a workshop shortly with their support. 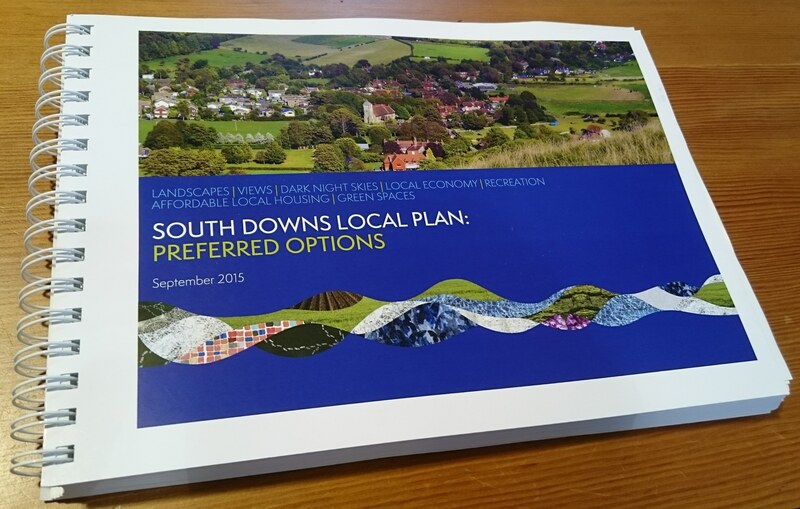 The National Park’s emerging Local Plan and there policy document, ‘Roads in the South Downs’ are a good starting point for our strategy. Other C7 updates: In Rodmell ESCC have just completed a new Speed Survey on the C7 at Rodmell which gives directly comparable figures pre & post installation of its traffic calming initiatives. The survey has recorded a modest speed reduction (4 mph southbound; 3 mph northbound). Not surprisingly there has been an overall increase in traffic since the previous survey in 2011. The increase is 6%. I fear that with all the housing and commercial development of in Newhaven this figure is likely to increase still further. Successful meeting to kick-off liaison between Piddinghoe Parish Council and OVCN regarding Egrets Way. Rodmell Parish Council are pleased to have had a new speed survey. ESCC and Kingston Parish Council have reached agreement on a community matched funding arrangement for improvements for pedestrians at the railway bridge at the bottom of Ashcombe Hollow. Progress has been made for a traffic island at Cranedown, Kingston Road Lewes. As I have previously reported, sadly earlier this year because of cuts in funding from ESCC and the National Park services on the 123 bus were cut. The current service which runs from Monday to Saturday is operating without any substantial subsidies so hopefully there won’t be further cuts. What is needed now is to get more people using the bus service and I am working with the Parishes of the Lower Ouse (POLO) to find ways of encouraging more residents to use the service as well as tourists. On a separate note that has been a small piece of good news with the 132 service now being diverted along the C7 on Sundays. Click here to read more. On a separate front there ongoing considerations by some of the parish councils and possibly Lewes Town Council to fund the restoration of the 130 bus service which did operate once a day from Rodmell to Brighton. As you may know the majority of planning applications are decided upon by the officers of the planning authority and not the members! Also, as you may know, the Ouse Valley area as far south as Piddinghoe is within the National Park. All planning applications are decided either by the National Park officers or members or under delegated powers by Lewes District Council. In fact, many applications are dealt with by the District Council and not the National Park. At the District Council there are specific rules if a parish council objects to a planning application. I’m not sure if the public or parish councillors are aware but if a parish council objects to a planning application and the officers of the planning authority would otherwise propose to give permission the application has to be considered by the members of the planning committee. Consequently it is very important for parish councils to make sure that their letters or emails are clearly marked as being sent on behalf of the parish council.